I want to see a web full of beautiful, real-time graphs that allow us to visualize our data in new and effective ways. My hope is to make this so astoundingly easy for you that you’ll start building all kinds of beautiful, powerful tools that bring your data to life. In this series, I will take a WordPress novice from beginning to end, start to finish, in creating a fully responsive, real-time graphing system that works within your WordPress site. I assume you know the absolute basics of WordPress — how to log in, get to your “Appearance” > “Editor,” and make basic changes to your site. As our working data example, we’ll be creating a basic workout tracker from scratch. We’ll make the forms, the database tables, and implement Flot — an awesome graph and chart library — to make your data come to life. I have a WordPress plugin you’re going to need for this project that takes care of most of the struggle of getting Flot charts onto your site. This series covers a lot of ground. For some of you, the basics of setting up WordPress for custom posts and form handling is no big deal. You may just want to skip right to the responsive graphing section. That’s why this is a multi-part series — to accommodate all user levels. First of all, I know there are better, more secure ways of doing this entire process, but I will refer you to the second sentence is this post — I want this to be easy. Once in place, you can make the process far more secure and adapt it as you need it. Second, everybody has a slightly different WordPress site. Your site may have a different theme or be on a different host than mine, so the admin view might look different. As long as you haven’t modified core WordPress files, this whole process will still work. I start with a fresh install and a blank WordPress site. 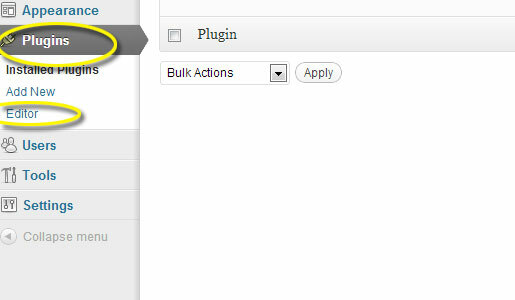 I’m using WordPress version 3.4.2 for this tutorial, so all screenshots will have that particular look and feel. I’m also using the TwentyEleven theme that comes stock with a fresh WordPress installation. The only changes I made to my site are in the “Settings” > “Permalink” menu where I selected “Post Name” as the URL structure. I also changed the “Settings” > “General” site title for the sake of this tutorial. So, without further ado, let’s jump into this series! I created this plugin to make the process a whole lot easier. The plugin includes a stripped-down version of Flot, an excellent graphing and charting library. But Flot doesn’t work well with WordPress out of the box. So, this plugin helps you by getting the files you need onto your WordPress site. If you’re a novice, I highly recommend you install this plugin. You may also want the PHP files I created for this series. For you newbies, I recommend you build these files from scratch along with me. You’ll learn a lot more this way, and you’ll be much better equipped to troubleshoot issues. One thing I try to always do when creating new functionality in WordPress is make sure it’s going to work reliably, even if I update my themes. 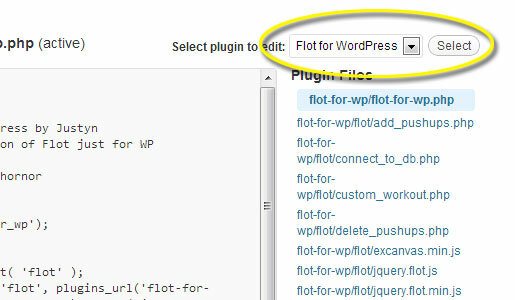 That’s where the Flot for WordPress plugin above comes in really handy. But, if you do want to use Flot without the plugin, just make sure you don’t store all of your work in the wp-content/themes folders. As soon as you change themes you’ll lose everything. So, create a blank custom PHP file. You can use a text editor. Just open a new file and save the blank document. I call mine “custom-workout.php”. If you want to upload the files somewhere else, that’s fine. But you’ll have to modify the paths and URLs in the PHP files that we’ll be creating. You should now have the custom-workout.php uploaded. Make sure the flot-for-wp.php file has been selected. This is where we need to be to let WordPress know about your new files. In the flot-for-wp.php file, you will see a section just for adding your own files. Here’s where you add your custom files for pulling and adding data for flot. you want in your WP install, just use a PATH to point to them. Sorry for the long-winded PHP comment, but these are the details that will make troubleshooting much easier for you later should you have any problems. We’re using the INCLUDE call to tell WordPress about the file we uploaded. So, let’s stop and check our work. For the absolute beginner, you’ve likely interfaced with some things you’ve never seen before; FTP, PHP files, and the plugin editor can all be intimidating. But, you’ve now laid the groundwork for building out this functionality. In the next article in this series, we will create some custom shortcodes and create a new database table for this tool. If thinking about that makes you start to have a panic attack… good! Power through this and stick with me! When he's not being a complete goofball, â€œtheyâ€� drag Justyn into the office where he pretends to be a Senior Editor and Content Engineer at Creative Content Experts â€” a content marketing firm out of NW Arkansas. He has 10+ yearsâ€™ experience in technical writing and geek-related fields. He loves WordPress, coffee, and peanut butter a little too much.